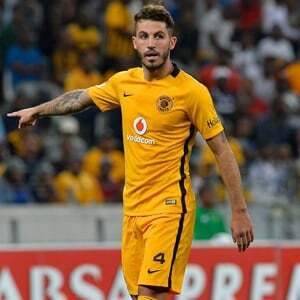 Cape Town - Kaizer Chiefs defender Daniel Cardoso believes the club's fans should be more positive in their support and not resort to negative tactics if things aren't going well. Speaking ahead of Chiefs' Nedbank Cup quarterfinal against Cape Town City on Sunday at the Mbombela Stadium in Nelspruit, Cardoso added that the Chiefs faithful could learn from the Mamelodi Sundowns supporters. Sundowns' fanbase are well known for staying after matches, regardless of the result, to sing and dance with the players. As such, the central defender urged the club's fans to display a similar approach in the stands. He said: "It's always great to play in front of a capacity crowd, and it's motivation for us because the fans always urge us to do well. "You know, losing or drawing in front of a crowd like that, they start having doubts and we don't want to put doubt in our supporters' heads anymore. "We want them to come and enjoy games and we want to enjoy it ourselves. If you see when Sundowns play, how they go and enjoy with their fans afterwards, it's great to see. "I think that's also something we need to start doing, interacting with our fans more after games, which shows appreciation to the fans and once we do that, they'll feel we're also showing loyalty to them. "We really do. After the games, they go and sing and dance with their fans, who make it nice for them. They join them instead of booing them and chasing them away. "That's what I wish our fans could do with us. If we do get a draw, it's a result and a point, instead they turn around and wave us away with their hand signals. "I ask them to rather show us the support, [because] we're only humans, not robots, and we're not going to win every game. So, hopefully the fans can turn around and help us out." The kick-off in Sunday's clash is set to be at 15:00 in Nelspruit.